Disclosure: This is a sponsored post. I am a Food Lion blogger, and I joined their blogger program because we share the same mission–to help you feed your family for less. Food Lion wants to help you get dinner on the table quick & easy. Their latest Dish it Up! promotion is fantastic–through January 20th, when you buy $10 of fresh chicken, you get corn, tomatoes, rice and tomato sauce for FREE, to help you make an easy meal. 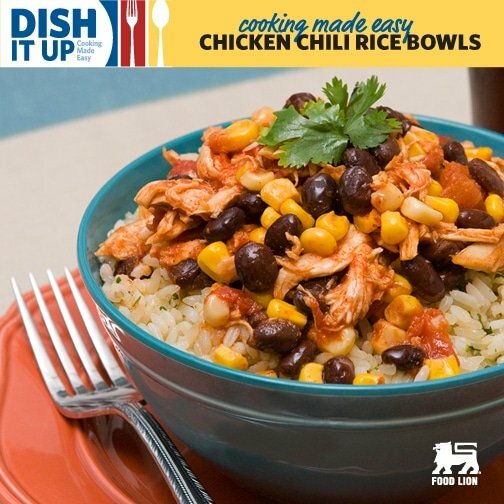 We tried these Chicken Chili Rice Bowls, and it took less than 30 minutes to cook. You can head over to Food Lion and get the recipe, but I’ve also posted it below. While you’re there, you’ll find other Dish it Up! weeknight dinners to help you get dinner done fast. Cook rice according to package directions, using chicken broth instead of water, if desired. Set aside. Meanwhile, heat oil in large saucepan or Dutch oven, over medium-high heat. Brown chicken 3 minutes on each side. Add diced tomatoes, tomato sauce, lime zest, lime juice, chili powder, cumin, and cayenne; stir. Bring to a boil; reduce heat to medium and simmer for 10 minutes or until chicken is no longer pink inside. Remove chicken breasts to a cutting board, letting sauce simmer another 10 minutes. Meanwhile, chop or shred chicken, then return to saucepan and add corn and beans. Cook until heated through and chili is slightly thickened. Season to taste with salt and pepper, if desired. Serve chili over rice. Serve with extra toppings like sour cream, shredded cheddar cheese, chopped green onions, diced avocado or lime wedges. The leftovers (if you have any) taste great the next day for lunch! Food Lion wants to help you Dish it Up! and get dinner on the table for your family. Two lucky MoneywiseMoms readers will each win a $50 Food Lion Gift Card. If you’re reading in an email subscription or feed, please click over to the post so you can use the Rafflecopter entry form. Good luck! This giveaway ends at 11:59pm ET on Friday, January 30th. Each winner will have 48 hours to reply back to their prize email from me, otherwise, I will have to choose alternate winners. Spaghetti is a quick weeknight meal here. Pot roast is easy because I have it cooking in the crock pot all day and voila, dinner is ready! We like making breakfast for dinner. Sausage and french toast with fruit. Scrambled eggs with sausage, cheese, spinach and tomatoes and toast on the side. An easy weekday meal would be spaghetti with sauce. Hotdogs are a quick and easy meal for a weeknight. I make several casseroles on Sunday evening so that the cooking is done for the week. My favorite easy dinner is pasta with a side of salad. Our easy dinner is soup, sandwiches and fresh fruit! My easy go to is always spaghetti! So easy and simple to make! Spaghetti – I love it! Thanks for the chance to win. My favorite easy night dinner is grilled cheese sandwiches and soup! Raviolis are an easy one! My favorite is turkey tacos. this looks so yummy! Must try it soon! I like to make hotdogs and fries. We like to do tacos for an easy dinner. Manwich sloppy joes, pork n’ beans and potato chips. Chicken and cheese quesadillas are an easy weeknight dinner for us. My easy quick dinner is Easy Chicken Chili in the crock pot. Its chicken, a can of beans, can of corn, some spices and a block of cream cheese. I like a grilled cheese and tomato soup. Slow cooker carnitas is my favorite. Baked chicken, rice and cream of mushroom soup. I like plain tilapia baked with olive tapenade on top. It is fast, easy, and delicious! I make easy western omelets. Chicken tender sandwiches, fresh veggies and fries. my meal is salad, garlic bread and spaghetti. I love making pancakes and bacon. I love making french toast and scrambled eggs! This looks DELICIOUS! My family would love this. Looks good. Now I want to make that! My favorite easy dinner is probably mashed potatoes! Ranch chipotle chicken tacos with corn salsa! My favorite easy weeknight meal is chili. The whole family loves it! Sausage and onions – one pan and you’re done! Tacos — quick, easy. and filled with veggies! I like to make a big pot of soup. Mexican casserole. 1 lb ground beef, chili powder, 2 cans black beans, 1/2 cup of salsa, bake til gooey, top with cheese & serve! I love spaghetti for a quick & easy dinner. I like meatloaf and mashed potatoes. My favorite easy weeknight dinner is egg and cheese sandwiches on english muffins. for a quick dinner we usually have pasta or else a quick soup. for quick and easy, I like to make spaghetti or black bean chili (which is basically black beans and salsa). Whenever I make soups or Chilis I always cook a double batch and freeze half. That way on nights we dont have time to cook, I grab a container form the freezer turn it upside down in a pot, put a lid on it, and turn the heat up. Soup or chili is ready in 5-10 mins! BBQ Chicken with rice & veggies. My easy go to meal that we all like would be spaghetti. I like chicken,rice,broccoli and cheese. We make tacos a lot when we don’t have much time. Quick and yummy. My go to quick meal is soup, salad and fresh fruit! Simple and Quick Meal would be Pot stickers with a Toss salad. When I am in a hurry, I always seem to end up making spaghetti! my favorite weeknight dinner is taco night, the only thing i need to cook is the meat! Easy dinner is a bowl of cereal. I make a fast Mexicali meal of soft beef tacos with refried beans and all the fixings! It’s hard to beat spaghetti! Crock pot meals are wonderful1 We love lemon chicken! Taco Soup. Five ingredients dumped into a pot or crockpot. I like easy! And it’s good, too. for an easy dinner i usually make breakfast or blts. My favorite easy supper is breakfast burritos!! So simple yet sooooo delicious! I’m happy with a burger and fries. My husband grills outdoors so there is very little cleanup involved. I love tacos or chicken thai lettuce wraps. Macaroni and cheese and hamburger, usually. Hehe. It’s easy and the hubby likes it. This is a great recipe. 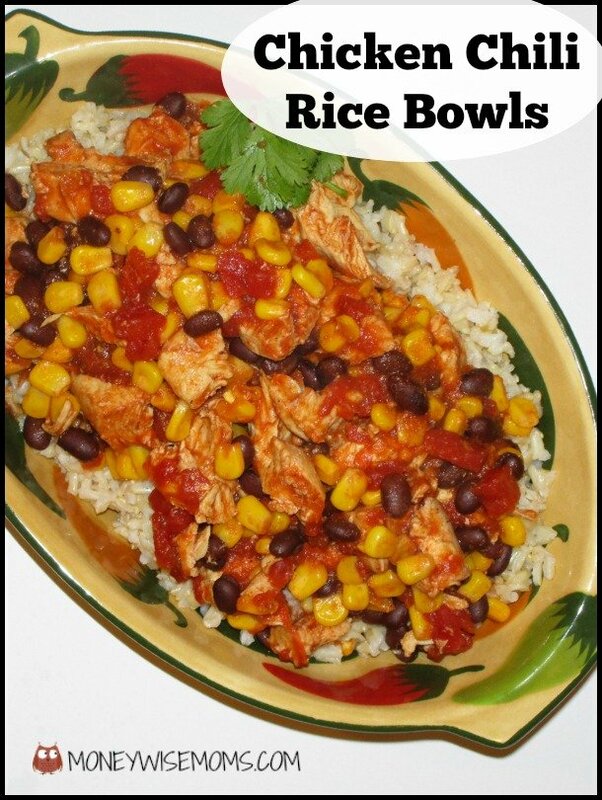 I make a lot of different kinds of chicken and rice bowls, I look forward to trying this one.